Trichotillomania is a “hair-pulling” disorder characterised by an irresistible or overwhelming urge to pull out hair from your scalp, beard, eyebrows or other parts of your body. Patients who have trichotillomania feel a sense of tension or unease and have the urge to pull at their hair. They might even try to resist it, but they can only feel at ease after they have pulled their hair out. The condition usually starts during preadolescence to young adulthood, and can continue into adulthood if not diagnosed and resolved. The condition can be triggered by stress, anxiety or any other kind of emotional affliction. It can also occur due to various traumatic episodes like death of a close person, physical or emotional abuse etc. The scalp is the most common site affected, followed by the eyebrows, eyelashes etc. Individuals with trichotillomania exhibit hair of differing lengths, some are broken hairs with blunt ends, and some new growth with tapered ends and some may be broken mid-shaft. One should note that overall hair density is normal in these patients, and a hair pull test is generally negative. There can be adverse psychological effect and patient may also stop going out in social gatherings due to the appearance. This may lead to increase in stress. So what does hair transplant have to do with Trichotillomania? The answer is simple, the disorder is one of the reasons for hair loss or even balding, and hair restoration is a solution for hair loss. 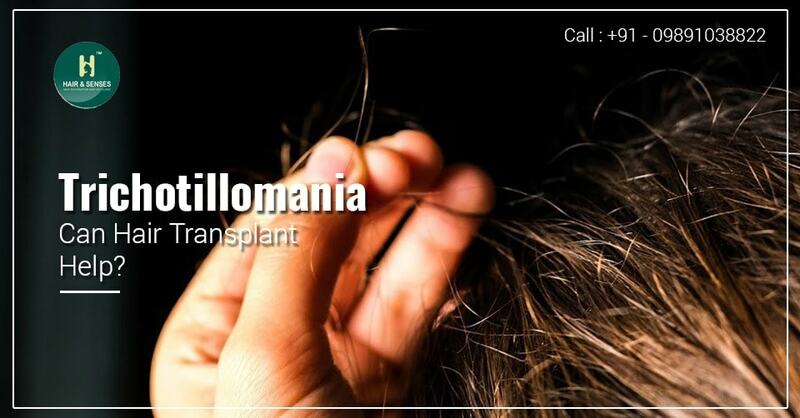 Ideally a person suffering from trichotillomania should not directly go for a hair transplant because if the disorder persists, they will pull at the transplanted hair as well, causing double the amount of hair loss - their natural hair and transplanted hair. Also, in such patients a transplant might cause even more hair loss, because the hair those are weak from being pulled at, can just fall out after additional stress from a transplant. The treatment for a Trichotillomania is to seek psychological help and also if required take necessary medications. Non-pharmacological treatments like Behavioural modification programme available for patients who suffer this disorder should be considered. If a patient goes to a hair transplant surgeon, they will usually request a complete medical examination with medical history to rule out any other possible illness that could be causing hair loss. If all of that is clear, the patient will be referred to a psychiatrist or psychologist, who are trained to diagnose and treat mental illnesses. There are patients, who become better after therapy and medication, but it is a slightly long process, and the patient has to follow through with the treatment. If one wants to go for hair transplant, then it should be taken into account that there are no persistent scalp symptoms and the area of hair loss has not increased. The patient should not be having compulsion to pull the hairs. For patients who have recovered from Trichotillomania a hair restoration procedure is a viable option. They can then go in for either of the two available options for hair transplant – Follicular Unit Transplantation (FUT) and Follicular Unit Extraction (FUE). FUE is a minimally invasive technique, involving harvesting hair follicles one by one by using micro punches from the patient's donor site, the back and sides of the head, and transplanting them onto the thinning or bald areas. FUT involves extracting a strip of scalp from the back or sides of the head and dissecting it into individual grafts, which are then transplanted on the bald spots. The difference between FUE and FUT is the method of extraction of follicles, while the rest of the procedure remains the same. But these options are only feasible after the patient has been treated for Trichotillomania. Because a Hair Transplant may resolve the visible symptoms but it cannot cure the real cause of the hair loss.